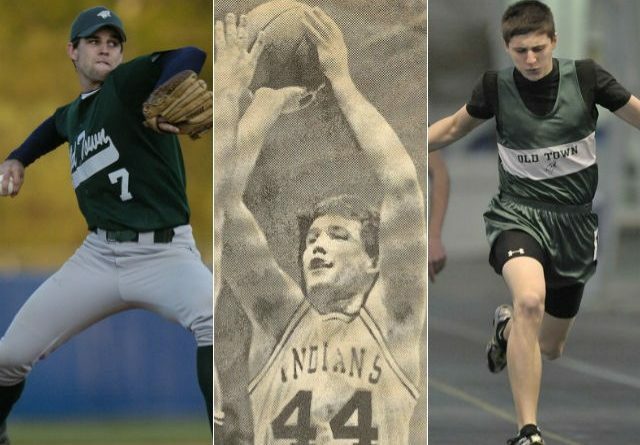 Jarrett Lukas (from left), Casey Costigan and Jake Leithiser are among the athletes who will be inducted into the Old Town Athletic Hall of Fame. OLD TOWN, Maine — A former Maine Mr. Baseball is among four athletic standouts who will be inducted into the Old Town High School Athletic Hall of Fame later this month. Jarrett Lukas, who earned the state’s top high school baseball honor as a senior in 2007, will be joined in the newest class by basketball star Casey Costigan, swimming standout Debbie Godsoe Rand and track and soccer athlete Jake Leithiser. Also set for induction are two contributors to the Old Town athletic program, Joe Cyr and the Sargent Corporation. This new class will be inducted during a ceremony scheduled for Saturday, Jan. 26, at the high school cafeteria. That event, which begins with a meet-and-greet session at 1 p.m. followed by the induction ceremony at 1:30, is free and open to the public. The inductees will be recognized at halftime of the boys basketball game against Hermon that afternoon when they will receive their plaques. Lukas batted .400 or better with 14 home runs during his three varsity baseball seasons, and as a senior the infielder won the Dr. John Winkin “Mr. Baseball” Award and was named Gatorade Maine Player of the Year and the Louisville Slugger Maine Player of the Year. Lukas was a four-year starter at quarterback for the Old Town football team. He started at third base for two years at the University of Maine where he batted .320 with nine home runs and 63 RBIs. He was named to the America East All-Rookie Team. Lukas left the UMaine baseball program after his sophomore year to focus on earning his degree in biochemistry. Today he is a member of the Green Berets, the U.S. Army Special Forces. Costigan (Class of 1991) helped Old Town win the Class A basketball state championship as a senior. Over his last two seasons his teams posted a combined 34-8 record, and Costigan ranks eighth among the school’s career scoring leaders with 908 points. As a senior Costigan was named to the Bangor Daily News All-Maine first team and the Eastern Maine Class A all-tournament team. He was a two-time All-Big East Conference first-team choice. Costigan, who played tight end and defensive end for the Old Town football team, later played basketball at Saint Joseph’s College in Standish where he helped the Monks win two conference titles and two NAIA District 5 championships. During his four years at Saint Joseph’s the Monks went 86-26, and Costigan was a team captain as a senior. Leithiser (2011) was a two-time state indoor high jump champion and placed sixth at the New Englands. As a senior he was undefeated during league regular-season meets, won three events at the league championships and was first-team all-conference in four events. He still holds three school records. Outdoors, Leithiser was the 2011 Class B state champion in the long jump and 300 hurdles. He also won Penobscot Valley Conference titles in the long jump and high jump and was a two-time PVC champion in the 300 hurdles. He was named first-team all-state in the long jump and twice was named All-PVC in three events. Leithiser was a three-year starter in soccer who amassed 27 goals and 10 assists. As a senior he was named a PVC first-team all-star and to the state Class B East Region all-star team. He was a three-time America East all-star in outdoor track and a two-time all-conference choice indoors at the University of Maine. He still ranks second in the heptathlon and 400 meters, fourth in the 4×400 relay and seventh in the 60 hurdles for the Black Bears. Leithiser competed in the 400 at the 2016 U.S. Olympic Trials. Godsoe Rand (1996) participated in cross country, swimming and outdoor track at Old Town. She won four state championships in the pool and 22 years after her graduation still holds school records in the 50 freestyle, 100 freestyle, 200 medley relay, 200 freestyle relay and 400 freestyle relay. Godsoe Rand, named the state’s 1994 Class B swimmer of the year, was a four-year letterwinner in cross country and outdoor track. Cyr (1959) was a three-sport athlete at Old Town but his legacy of contributions to the school’s athletic programs has endured long beyond graduation. He has been heavily involved in such projects as installing lights and the all-weather track for Victory Field and the Cyr Family Field House at the Old Town-Orono YMCA. His contributions also have allowed for the school’s swimming pool to remain open. The Sargent Corporation has been a major contributor to the school’s athletic programs. The company was active in the Victory Field renovations, completing the groundwork that made way for an eight-lane, all-weather track, grandstand, press box and new practice field. Sargent previously made key donations that brought lights to the facility.